Just before Hurricane Irma arrived much too close to our front door, I was given a Berkey Water Filter to try. Little did I know, I would be using it to it’s full potential just about a week later when we went into full hurricane preparation. We drink a lot of water in our house. We buy bottled spring water. It’s no cheap but it’s what we do. As we started to prep for Hurricane Irma and we realized the potential to be without power and/or water was becoming very real, it was almost impossible to find bottled water at local stores. I put our Berkey Water Filter to use and filtered just about 5 gallons of water and put it into a cooler so it would be one less thing we had to worry about. I have used water filters in the past and quite honestly, they never filtered well enough. When I drink water, I don’t want it to taste like anything. I had heard nothing but good things about the Berkey and I was excited to try it. The Big Berkey holds 2.25 gallons of water. It comes standard with 2 Black Berkey Purification Elements but will take 4 total. It is ideal for small to medium families, and for use during travel, outdoor activities, or unexpected emergencies. It fits perfectly on my kitchen counter under the cabinets, standing 19.25″ tall. For normal everyday use, it serves 1-4 people. Setting it up, including priming the filter, took about 20 minutes. It was not complicated at all and the instructions that are included are very easy to follow. Most importantly – for me – out of all of this, the water tasted PERFECT. No flavor and no aftertaste. It was clean, filtered water. The Big Berkey was a lifesaver during Hurricane Irma. Post-hurricane, it has become a permanent fixture in our kitchen and we are no longer buying bottled water. Not only will we not have endless plastic water bottles to recycle, but we will also save money by not buying water. 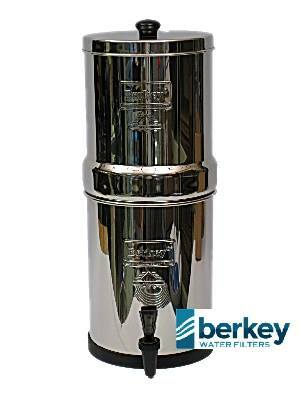 You can learn more about Berkey Water Filters here….